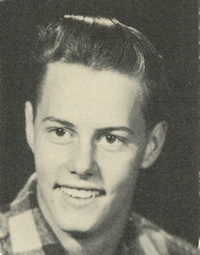 Obituary – Bruner, Merlin Gene « Perry High School Alumni Association, Inc.
Football 48-50, Basketball 46-50, Baseball 48-50, Student Council President 49-50, Boys State 49, Junior Class President 48-49 Home Room President 49-50, Perryscope Staff 49-50. California resident of 30 years Mr. Merlin “Zeke” Bruner, 73, died March 9, 2007, of respiratory failure in Victorville after being in the Victor Valley for two months. Zeke was born Sept. 18, 1933, in Morrison, Okla. and had been living in Tehachapi. He was retired. Zeke attended Central Oklahoma State, served in the U.S. Navy, was affiliated with the Masonic Lodge and attended the Seventh Day Adventist Church. Zeke is survived by his children, Steven Bruner, Cindy McMullin, John Bruner, Joseph Bruner, Becky Featherstone and Leah Rennie, 11 grandchildren and two great-grandchildren. A memorial service will be held at 2 p.m. today at Victor Valley Mortuary, 15609 11th St. in Victorville. Zeke will be cremated.